"Chilean sea bass, also known as Patagonian toothfish, has landed on lots of 'do not eat this' lists due to overfishing, but the fish can be found through sustainable sources. Flavored mayonnaise keeps the sea bass moist while it's cooking, and you can create countless sauce variations by changing the seasonings. The recipe is inspired by the cuisine of San Sebastian." Preheat oven to 475 degrees F (245 degrees C). Line a rimmed baking sheet with parchment. Mix together mayonnaise, sherry vinegar, smoked paprika, 1 teaspoon salt, garlic, and cayenne pepper in a small bowl until sauce is combined. Spread olive oil on the bottom 2 individual-serving baking dishes. Cover oil with a single layer of pepper slices to cover the bottom of the dishes. Season the fish generously with 1/2 teaspoon salt and place on top of the pepper slices. Spread the tops and sides of the fish with the prepared sauce, spreading the thickest layer on top. Grate almonds over the filets to cover. Transfer baking dishes to prepared baking sheet. 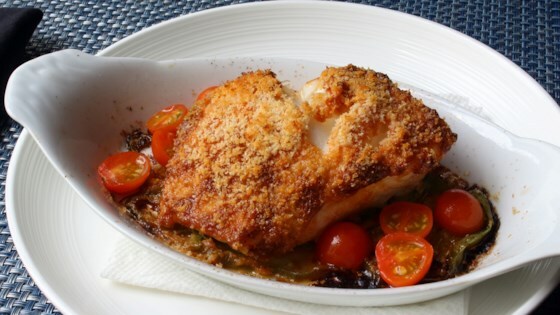 Bake until beautifully browned and fish flakes easily with a fork, 15 to 18 minutes. Internal temperature should reach 135 to 140 degrees F (57 to 60 degrees C). Garnish with tomatoes. Rich, light and delicious sea bass. You can substitute any type of whole almond for the Marcona almonds. Fairly spicy, which we enjoyed. Nice meal. I'd recommend a little less cayene pepper. Super easy! I will make this again! Next time, I will probably only use 1/2 tsp of cayenne pepper, as this was really spicy!